What is a publication ? What is it for ? 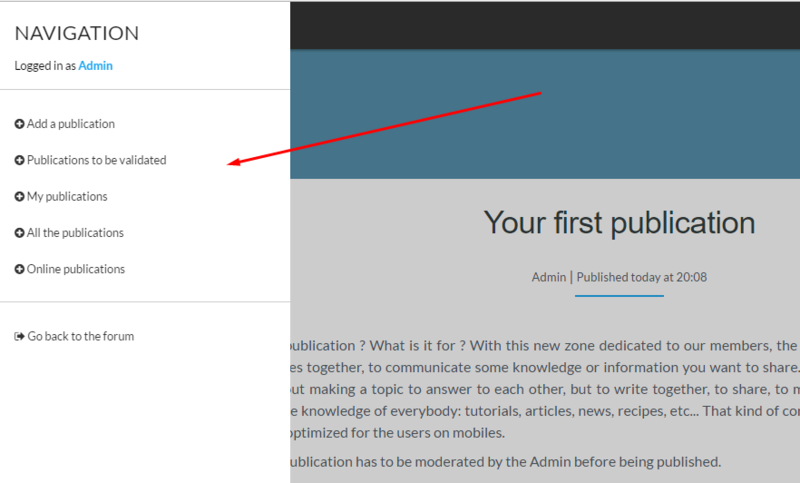 With this new zone dedicated to our members, the publication system permits you to co-create articles, in order to share knowledge or information. Indeed, in the publication section, it's not about making a topic to answer to each other, but to collaborate as a team to create a unique content like, tutorials, articles, news, etc., that combines the knowledge of each member. That kind of content is an alternative of the forum topics. Also, it's optimized for mobile users. Each new publication has to be moderated by the Admin before being published. You can access the section via the Publications button on the main left menu of the forum. The publications section has a modern, minimalist and ergonomic design, the purpose it to be 100% compatible with the mobile pages and the AMP project. The "Accelerated Mobiles Pages" project (or AMP) is an open source initiative, supported by several search engines such as Google. It allows the editors to create easily a content and to load it immediately everywhere.